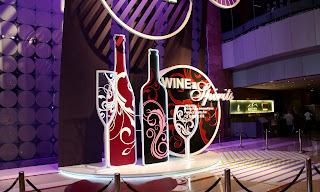 The Hong Kong International Wine and Spirits Fair 2011 was hugh. This is my third trip to this fair. 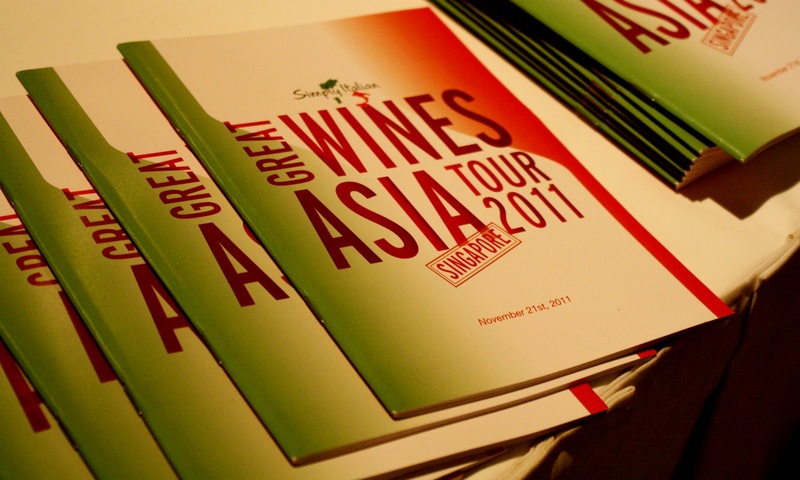 This time round it was held between 3-5 nov 2011 at the Hong Kong Convention and Exhibition Centre. Organized across 2 halls with over 900 exhibitors and covering a gamut of wines, liquor and wine accessories, it certainly had lots to offer to the over 18,000 trade visitors who took part for the 3 days. Wines from 24 countries were showcased (at least going by what I came across during the fair). The delegation from Italy occupied the largest exhibition space this time round. 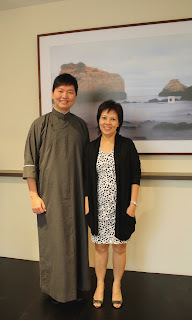 Needless to say, the usual suspects from the new and old world countries were there. The ‘not so often’ seen ones came from places like Brazil, Korea, Slovenia, Georgia, Uruguay, Tunisia, Japan and Bulgaria. I’ve uploaded pictures I took during this fair at www.facebook.com/spiceinwine (3 photo albums, one for each day); check them out to get a glimpse of the fair. h. Tannat from Uruguay’s Pisano. Other curious finds were the Japanese wines from the Yamanashi prefecture, and surprisingly italian varietals grown in Indian soil. My previous exposure to wines from India were those using french varietals alone. This time I had the chance to taste wines made from italian varietals as well. The Reveilo Wines from India made with grillo, nero d’ avola and sangiovese showed good flavours, balance and finish. Among the wines from Brazil, its range of sparkling wines with good flavours and structure impressed me (both dry and off-dry styles); and Hungary had an eye catching pavilion which showcased its whites, reds and thrilled visitors with its Tokaji wines. Three other pavilions which drew people with their sweet wines were Germany, Austria and Spain (with its pedro ximenez , like the one from Bodegas Cruz Conde). The Simply Italian Great Wines Asia Tour 2011 was held in Singapore’s Shangri-la Hotel on 21 Nov 2011. 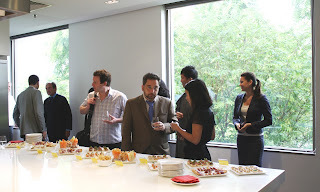 More than 20 tables of wine from different winemakers were there to introduce what Italy has to offer to members of the local trade, press and other stakeholders. 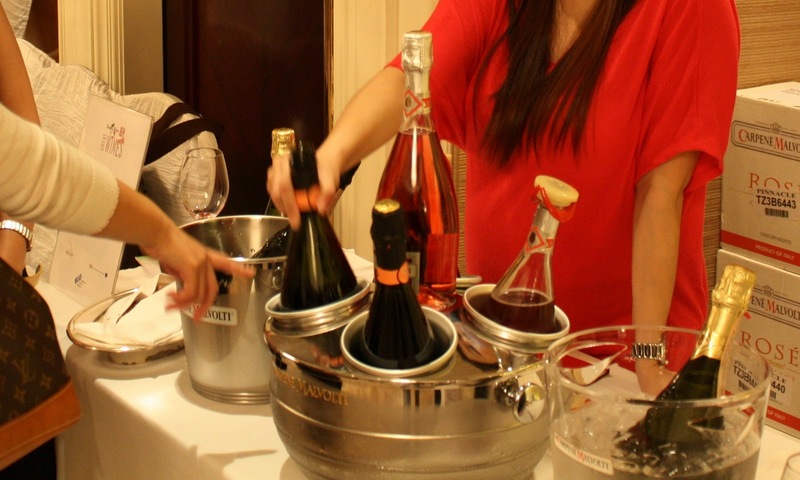 Sparkling whites and rose to still wines were showcased during this event at one table or another. Some labels already have local representation through companies like Cellarmaster Wines, Pinnacle Wines, Grand Vin and Spirito Divino (to name a few). a. Sparkling wine in the form of Prosecco was well represented among the tables. I had the good fortune to meet the representative from Carpene Malvolti who explained the key role Antonio Carpene played in the production of sparkling prosecco back in 1868 (the rest as they say is history). Apart from its DOCG proseccos, this winery also offered a Rose Brut and a Gewurztraminer Brut for tasting during this event. b. Locally known italian labels like Masi, Pio Cesare and Biondi Santi made their presence felt; the crowd at these tables give a hint of their popularity in the local market. c. I usually don’t get the opportunity to buy wines from Lugana at local wine retail outlets; it was therefore good to see wine companies like Zeni and PR.AS.CO SAS showcasing these wines. d. Whites from Friuli and Alto Adige showed well. Cabert S.p.A. and Alois Lageder showcased interesting whites from their respective regions. I did not get the opportunity to cover all the tables (it was a good crowd at this event) but am happy with the showing at those which I managed to visit. Ten years ago Bali Lane can be described as a quiet, almost nondescript place. Things changed a few years back when outlets like Blue Jazz and Nabins came into existence and enlivened the atmosphere. Young ones suddenly had a spot in Nabins to sit on carpeted floors, smoke shisha and chill out with big pillows. The middle eastern songs and music with their exotic vibes often manage to bring a degree of life even to my middle aged bones. Those not too keen to sit on floors found favour with the alfresco dining experience which Blue Jazz provided. It provided a quaint hangout for those who want 'to see and to be seen'. Many other eateries came along, made their presence and quietly went their way; but these 2 establishments have stood the test of time so far. Rev Distribution came into the scene a few years back and has been operating as a wine retail outlet at 31 Bali Lane ever since. Apart from selling wines, it used to hold regular wine tasting sessions to introduce wines and wine culture to new wine enthusiasts. 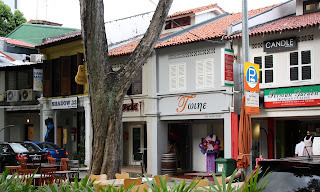 Recently the management decided to convert their operation from a retail outlet into a wine bar, and renamed the place Twine. Twine is open all week except on Sundays. It begins operation from 1pm and closes at midnight. It can comfortably accommodate around 20 people (seated) and a few more as standing crowd. It can be termed as an ‘inclusive’ wine bar as it also offers beer and hard liquor to customers who wish for other beverages for the evening. It presently carries wine from France, N. America, Chile, Argentina, Australia and New Zealand. The prices start from around $35 and upwards. It also serves finger food. 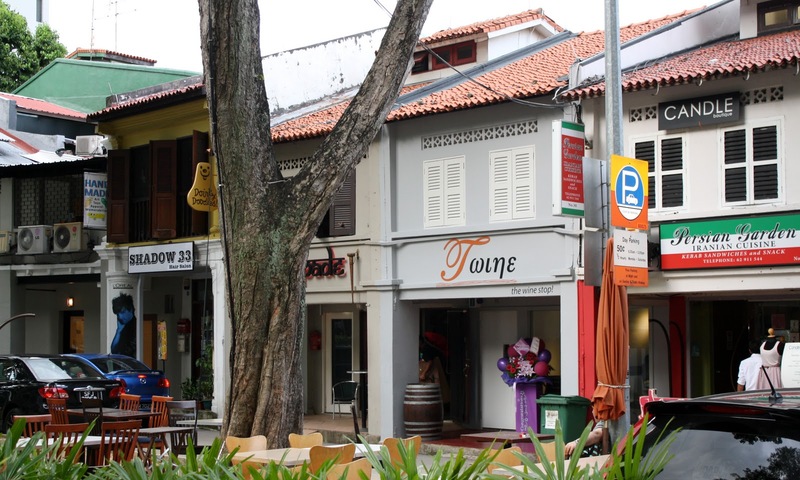 If you however prefer something more substantial, you can order food from 2 eateries along this lane and it will be brought over to Twine for your consumption (without any additional charge). 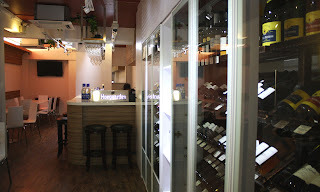 The management is keen to offer this place for private events, parties and wine tasting sessions as well. If you are keen to hold an event here, you can seek assistance at 64880379. You can also get information on promotions which Twine offers at www.facebook.com/TwineBar. The questions from a wine glassmaker to his guests: “What’s the point of buying a good wine only to drink it in a manner where it can’t show itself properly? Ain’t you wasting the wine and missing a good emotional moment?” Valid questions I must admit. Wednesday morning I swung by Miele’s gallery (at Winsland House 2) to attend a Comparative Riedel glass tasting conducted by Mr Georg J. Riedel. b. since different grape varietals offer different character profiles, to see if it is logical (and may be sensible) to drink a particular wine in a glass designed to show best what the wine has to offer. Mr Georg suggests that “wine in a wrong type of glass does not allow you to maximize the joy a wine can give”. We need to instead go beyond the common practice of using an ‘all purpose red wine glass’ for all our red wines or ‘one white wine glass’ for all our whites. 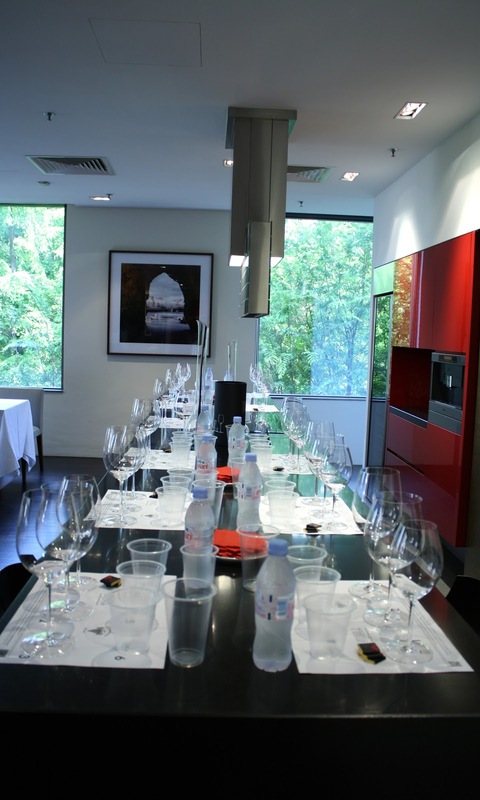 Since this blog is primarily for new wine enthusiasts (and some of you may out have had the opportunity yet to taste wines using the Sommelier range of Riedel glasses), I’ll briefly highlight a few of the exercises we did during this workshop and mention the ‘findings’. It may be useful to those considering the purchase of wine glasses for personal use in the near future. 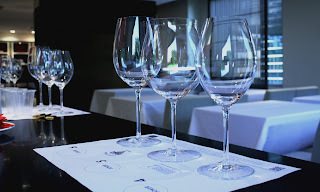 For this workshop, we were introduced to 3 Riedel wine glasses; Sommeliers Hermitage 4400/30, Sommeliers Burgundy Grand Cru 4400/16 and Sommelier Bordeaux Grand Cru 4400/00. We also were given 3 wines; a pinot noir, a shiraz and a cabernet sauvignon, each in a plastic cup to be used during the tasting. Exercise 1: Tasting water (… yes, not wine yet but water) to see how each of these glasses deliver the water to the tongue and to identify the particular glass favoured by participants to consume water. Findings on delivery: Each of these glasses does in fact deliver water to different parts of one’s tongue. The Hermitage glass delivered water to the back of one’s tongue, the Burgundy glass to the front of the tongue and the Bordeaux glass seem to allow the water to fall almost ‘everywhere’ over the tongue. The minerals and salts found within the water showed itself slightly differently when using each of these 3 glasses. Most participants favoured using the Bordeaux glass as it showed the water with a softer body and a smoother feel. Exercise 2: Tasting pinor noir in all 3 glasses. Findings on Aromas: We tried the Burgundy glass first and I must say it is wide enough to almost cover one’s face :p When with the nose (and for some their face) ‘in the glass’ as the speaker suggested, you get aromas of red fruits, spice and minerals coming forth in layers. In the Bordeaux glass, the spice note gets prominent in the nose but the red fruit aromas tend to be much subdued. It’s as if you almost lost the primary red fruit notes. The Hermitage glass skipped the red fruits and spice elements and instead revealed yeast and wet feet aromas; not exactly an ideal glass to nose this pinot. Findings on Palate: The Burgundy glass reveals a wine with a lively body, red fruits and spice flavours, and a good balance between the wine's components in one's palate. 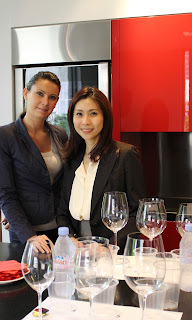 The Bordeaux glass shows the wine differently. The pinot takes on a linear flavor profile with bitter notes and high acidity which stifles the fruit flavours. The Hermitage glass reveals a concentrated, intense wine without doing much justice to the flavours. The Hermitage glass fared slightly better than the Bordeaux glass, but not as good as the Burgundy glass for the pinot. Exercise 3: Tasting shiraz in a plastic cup, the Bordeaux and Hermitage glasses. Findings: For me this was the most interesting exercise of the morning. Sipping shiraz from a plastic cup revealed lovely yielding fruit flavours with ‘sweet-fruit' notes, good acidity and a pleasant finish. The shiraz tasted enjoyable when tasted from a plastic cup! Surprisingly the same shiraz in a Bordeaux glass became overly thick and concentrated on the palate revealing black cherries and a short finish. One loses the yielding flavours which was witnessed in the plastic cup. However in a Hermitage glass the shiraz showed a supple, rounded body with flavours of black berries and spice; and a lingering finish. The advice of the speaker: “ Don’t use a Bordeaux glass for your shiraz, though one may think that is the next best option for a glass as both wines somewhat have similar body strengths and structures). 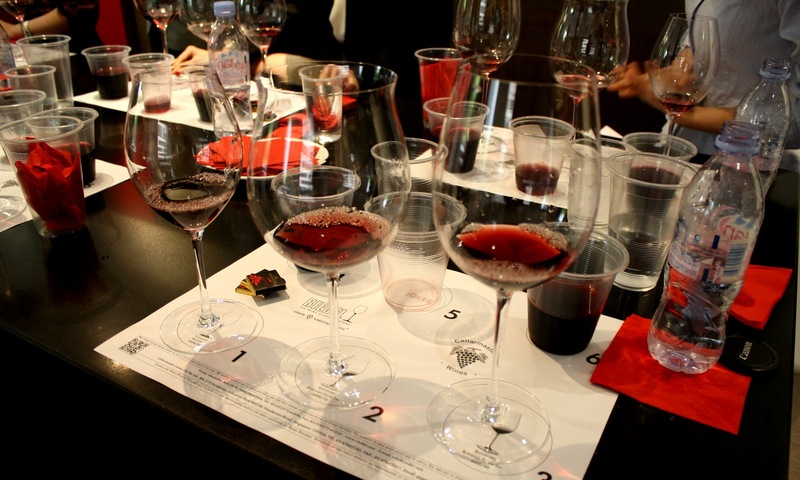 Findings: In the Bordeaux glass one gets aromas of black currants, cassis, cedar and chocolate. Palate shows a rounded, supple body with good depth and balance. In the Burgundy glass much of the aroma is lost, and the palate reveals sour and green notes rather than the fruits. Tannins are slightly abrasive and the body shows a linear profile. 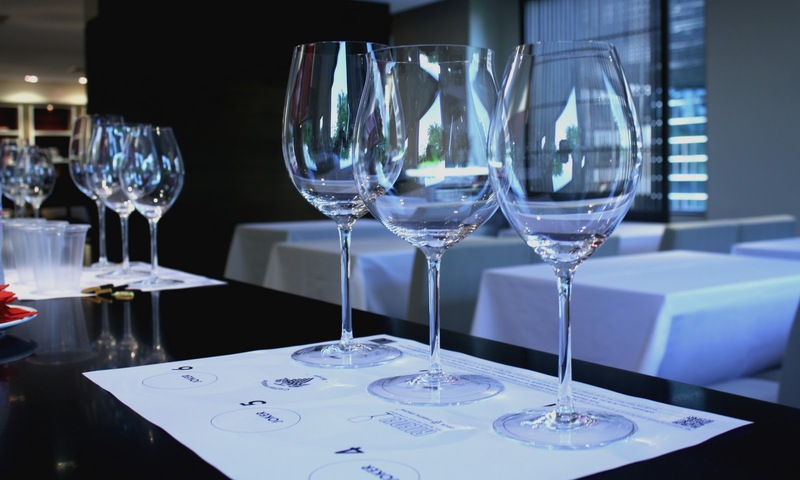 The shapes of a wine glass does seem to affect the aroma and flavor profiles a wine can reveal to a drinker. In the right glass one gets a better mouthfeel, layers of flavour, a good balance and finish from a wine. 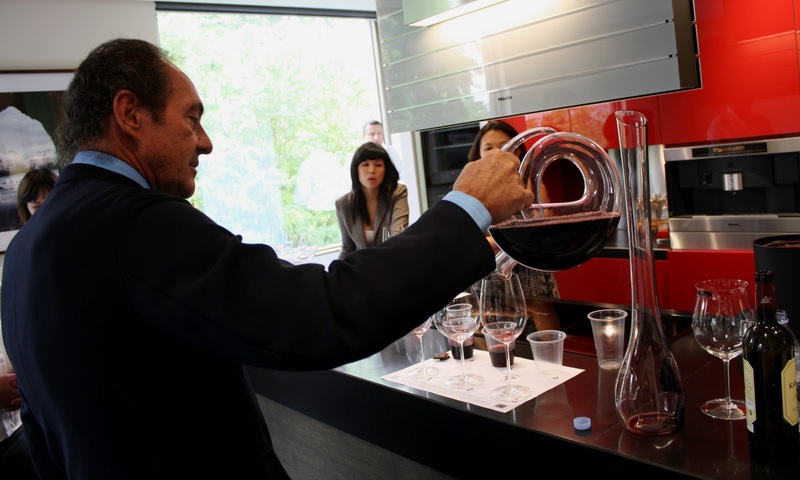 Georg J. Riedel looks upon glasses as “tools for noses and palates” and attending this workshop makes one appreciate the need for the 'right type of tool' to get the most out of a particular wine.